Panettone filled with Amaretto macaron flavoured cream, coated with plain chocolate and Amaretti macaron grain. Hand-wrapped in elegant rustic Andina paper . 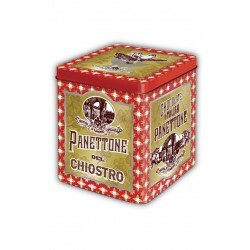 The Panettone Chiostro di Saronno is produced according to the traditional recipe and criteria, through a slow and natural leavening and all ingredients, from flour to milk, eggs to butter, candied fruit to yeast, are of natural origin. 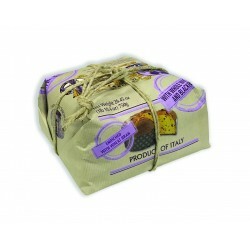 Panettone Milanese with its modern variants has a particular taste which is enhanced only by combining certain types of wine. The wine for Panettone must be sweet fragrant and with a delicate taste that does not dominate the nuances of flavor from the ingredients Panettone dates such as a Moscato or Passito. Put Panettone in a microwave (low power for 3 minutes) or in the oven at low temperature just before serving; in this way you have a very fragrant cake. Toasted slices of this bread can be served with cappuccino for breakfast or as an afternoon snack with espresso. Serving French toast with panettone is another option. Wheat _our, macaron flavoured filling cream 14% (glucose sirup, sugar sirup, condensed milk, maltodextrins, alcohol, dextrose, thickening agent: pectin, colouring agent: E150d, macaron flavour 1%, preservative: potassium sorbate), fresh eggs, sugar, butter (milk), milk, plain chocolate 8% (sugar, cocoa paste, cocoa butter, emulsi_er: soy lecithin, _avours cocoa: 51,5% min), macaron grains 3% (sugar, bitter almonds, egg white, _avours, leavening agents (ammonium bicarbonate - sodium carbonate)), natural yeast (wheat), emulsi_ers: mono and diglycerides of fatty acids , _avours, cocoa butter, salt. May contain traces of other nuts..